IN BLOOM is my debut novel—the first thing I’ve written outside of school—and it took me completely by surprise. It never occurred to me that I was a writer until, during the economic downturn, my career path shifted. I was a dress designer who, due to a company merger, became a lingerie designer. Not being an expert in lingerie, I wasn’t quite cutting it in my new position, and it was soon suggested that I try something else, like starting the e-commerce website for the lingerie line, In Bloom. In an attempt to drive traffic to the website, I started a blog, and again limited by my lingerie knowledge, didn’t know what to write about. My solution to my content problem was to write a fictional serial about an engaged girl who worked for the line. In Bloom is predominantly a bridal lingerie line and I wanted to use lots of wedding keywords so I thought the blog could be her live wedding journal. As I started writing, though, I realized I couldn’t plan her wedding without knowing how she fell in love with groom…and it began. I started writing and was swept away. 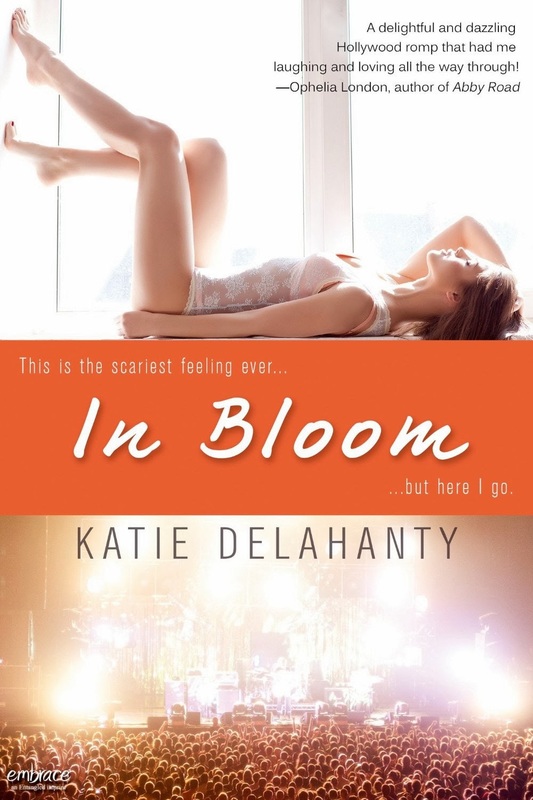 As Olivia Bloom fell in love with Berkeley Dalton, I fell in love with storytelling, and IN BLOOM was born. Swallowing fear, Olivia Bloom vows to be brave—to leave her safety net behind—and drives cross country from Pittsburgh to pursue her dream of becoming a Hollywood costume designer. When Liv arrives in LA, her costuming job disappears and she is taken under the wing of her Hollywood-insider neighbors, Blair and Parker, who help her land a freelance position at a star studded fashion show where she has an unfortunate run-in with the lead singer of her favorite band, Berkeley Dalton. Making my way through the boisterous crowd, I head toward the exit on the far side of the airplane hangar, planning to stop to use the restroom before I leave. The bathrooms are located in a poorly lit, narrow corridor, and I avoid touching the pale blue walls as I squeeze through to the end. Twisting the knob on the door to the ladies room, I find it’s locked. Sighing, I turn to wait and come face to face with the bluest eyes I’ve ever seen. Jumping in surprise, I do a double take. The face attached to the eyes is so familiar…perfectly formed jaw…messy dark brown hair…I can’t help but look twice before the recognition registers. Berkeley Dalton. Lead singer for Berkeley & the Brightside, my favorite band. Sucking in a breath, I tear my eyes from him as my stomach contracts, and I resist the urge to hyperventilate Miss Piggy-style at his feet. I stand perfectly still, sweating and praying to the Restroom Gods to open the door so I can escape. What is she doing in there? OMG. He’s talking to me. His voice is smooth and slightly hoarse as though he’s been screaming into a microphone all night. Hmm. Think. Think. Think. Words. Use them. But it’s no use. My brain shuts down and fills with champagne bubbles. Say something! What? What kind of crazy talk was that? Why would I say that? What is wrong with me? I want to reach out and pluck back each and every word, but it’s too late. Maybe I can just stab myself in the throat with a stiletto—there has to be one around here somewhere. Berkeley, to his credit, registers only a moment of confused surprise across his perfect features before he resets his expression and studies me with amusement in his eyes. Great. He’s laughing at me. As well he should. I’m giving away “Liv Bloom’s Valentine’s Indulgence Kit” (US & Canada Only) and a $25 Gift Card to Amazon (International). Enter via the rafflecopter. Such an interesting story (yours and Olivia's)! Thanks for the post. So happy to be here! Thank you!